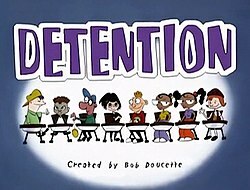 Detention is an American animated television series created by Bob Doucette that premiered on Kids' WB on September 11, 1999 and ended on March 25, 2000, the series ran for thirteen half-hour episodes in one season. Since 2018, the show has been available on iTunes. The series is about a group of eight troubled sixth grade students from Benedict Arnold Middle School in Oak Forest who continually find themselves in detention. The kids are constantly trying to stay out of detention and out of trouble. Shareena Wickett (voiced by Tara Strong) – A 12-year-old goth girl that prefers to be a free spirit and finds pleasure in the sublime. Shareena's beliefs are not taken seriously by her parents. Her hobbies include reading horror stories and performing séances. Emmitt Roswell (voiced by Billy West) – A conspiracy theorist who believes that intelligent life exists in outer space and is determined to make contact with aliens. As revealed in Boyz 'n The Parenthood, Emmitt has an estranged father. Eugenia P. Kisskillya (voiced by Kathleen Freeman) – The Physical education teacher and detention monitor of Benedict Arnold Middle School. Having been a military sergeant in the Marine Corps, Miss Kisskillya bosses the children around like such and usually pronounces "detention" as "dee-tennnn-shun!!" The only student she likes is Shelley Kelly, who serves as her "Teacher's Pet" and whom she refers to as "Private Kelly". Despite usually being oftentimes tyrannical towards the children, she has been shown to be a nice person. She is based on creator Bob Doucette's grade school teacher who was a nun, as well as Freeman's character of the strict Sister Mary Stigmata from The Blues Brothers and Blues Brothers 2000. Jim Kim (voiced by writer Roger Eschbacher) – A shy kid with a love for comic book superheroes. He takes on the characters' attributes at inopportune times. Ramone "Gug" Gugleamo (voiced by Carlos Alazraqui) – A short kid with a short temper. Constantly left out of competitive sports, Gug constantly picks fights with kids twice his own size and has even wanted to take down Miss Kisskillya. He and Emmitt have their occasional rivalries, however, they both agree on their lack of patience with Jim. Duncan Bubble – A quiet boy who is always playing with a yo-yo and never speaks. He instead uses his yo-yo to spell out messages (for example, "Thanks guys", "Boring", and "Yeah"), accompanied by an electronic voice (done by creator Bob Doucette) reading the message. He is based on a deaf friend Doucette had during production. Lemonjella and Orangejella LaBelle (voiced by Tia Mowry and Tamera Mowry) – A pair of identical twins. They have been known to get themselves in trouble by hacking into the school computers and deleting library fines. Their scientific descriptions sometimes confuse Miss Kisskillya. They have shown to be competitive with each other. Shelley Kelly (voiced by Pamelyn Ferdin) – An optimistic and peppy girl who wears a Ladybug Scout uniform every day. She constantly kisses up to Miss Kisskillya and has a crush on Emmitt. As a result, she is often detested by the other kids, whom she wishes to be friends with. However, on some occasions Shelley is often an ally to the kids. In the fall of 1999, the show aired on Saturdays at 10:30 a.m. and 11:00 a.m. EST. In the spring of 2000, the show moved to 11:30 a.m. EST on Saturdays. Reruns of the TV series aired on the Kids' WB Friday afternoon lineup from September 8, 2000 until August 31, 2001. Shareena misses her chance to get tickets to a rock concert because Miss Kisskillya gives her detention. So she decides to team up with Shelley in the Home Economics Bake-Off to get even with her by creating a volcano cake. Meanwhile, Emmitt, Gug, Jim, and Duncan try to get Duncan's yo-yo back from Miss Kisskillya. The gang represents the school in a spelling bee. But when Lemonjella and Orangejella start to get competitive with each other, the gang has to intervene. As Benedict Arnold Middle School is throwing a "Friday the 13th" disco dance party, the kids are getting ready for the dance while Shareena stumbles upon an old photo of her great aunt Hanna and plans to perform a séance to contact her from the dead. Meanwhile, Emmitt is planning to contact with UFO's that are set to arrive on the school roof and Shelley joins him. When Miss Kisskillya tells the kids that they are destined for detention, they hold a contest to see who can stay out of it, except for Shelly, who tries to get in detention instead. Shareena and Shelley decide to skip school and Miss Kisskillya tries to find them. Meanwhile, Emmitt and Gug try to compete for class president, throwing Jim in between. Desperate to meet the star of their favorite television show at a bookstore, the kids plot to sneak away from Saturday detention, but Miss Kisskillya is headed to the same place. Shareena auditions for a part in a school play, but it is Gug who lands the role thanks to Miss Kisskillya, sparking both jealousy and revenge in Shareena. The kids prepares for a television quiz show and Shareena starts to hang out with popular girls called The Vanities just so she can get close enough to meet a boy that she has a huge crush on, much to the dismay of the others. When Shelley announces that she won an essay contest for a trip to Washington, D.C. she invites the rest of the gang along with Miss Kisskillya to come, however, Shelley is accidentally left behind when the plane leaves, and goes to great lengths to get to Washington. Meanwhile, as the gang arrives in D.C., Emmitt becomes paranoid when he sees a "Secret Service" agent following him and his friends. When things begin to mysteriously disappear at school, Miss Kisskillya blames Lemonjella and Orangejella, who then set out to find the real culprit. The gang gets paired with each other to take care of water balloons as an assignment for parenting. But while Shareena is stuck with the "baby", Emmitt tries to wait for his father. Lemonjella and Orangejella find a map marking the location of buried treasure, but greed causes the twins and the other kids to lose the fortune to Miss Kisskillya. When Miss Kisskillya promotes Gug as Benedict Arnold's new hall monitor, he goes mad with power by issuing detentions to his friends and classmates, meanwhile, Shareena plans a house party while her parents are out of town. ^ "Detention Cast and Details". TV Guide. This page was last edited on 15 February 2019, at 08:59 (UTC).